Made from high quality materials, produced upon DIN standards, to obtain a precise and easy cut. Brad point tip provides accurate positioning for starting the hole. Bit is precision ground for use in demanding luthier woodworking, and other woodworking applications where an exact hole size is required. Spur cutting edges reduce splintering and ensure a smooth, clean hole.Wide flutes provide a fast, continuous flow of chips.Special extra lenghts available. Precautions are necessary specially when you use power drill. It is a powerful tool, you must be very careful while using and storing it away. 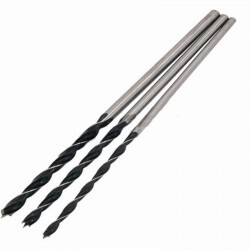 Drill bits can be used interchangeably. We recommend to wear work gloves. When drilling the target surface, wood chips may fly off into the surrounding space, so wear safety glasses to protect your eyes and work gloves. After every drilling job, turn off the switch and unplug the power cord. Never change drill bits when the power cord is still connected to the power supply. Ensure that the chuck is tight before using the drill. 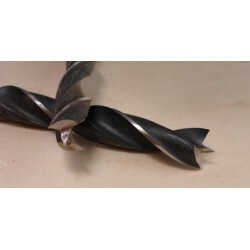 A loose chuck is hazardous, because it will not hold the drill bit in place. If the drill bit comes undone and flies off in the middle of a job, it can cause great danger to surrounding people.